All Black lock Tom Donnelly will miss the start of the Highlanders' Super Rugby season after suffering a partial dislocation of his shoulder. The 29-year-old second-row left the field after just 10 minutes when the Highlanders drew their pre-season match against the Chiefs in Taupo last weekend, with scans on Tuesday confirming a minor dislocation. Donnelly will not require surgery but has been slated for a six week recovery period, joining All Blacks skipper Richie McCaw on the sidelines. He is expected to return for the Highlanders in their match against the Brumbies on April 1. There was further bad news for the franchise with confirmation that new signing Kurt Baker has been ruled out for three months with a stress fracture in his back. 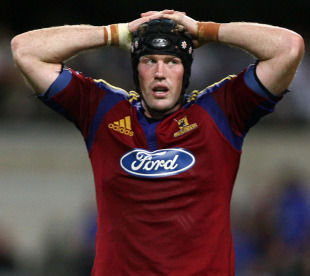 Baker will be replaced in the Highlanders' squad of 32 by Kade Poki, who is in the wider training squad. Baker's injury requires rest and rehabilitation, with a medical assessment to be completed in May to determine his playing fitness. If he clears the medical assessment, he can only be bought back into the squad as a replacement for another injured player. General manager Roger Clark lamented the blow for Baker, who had an outstanding season in 2010. "Kurt signing was a long-term strategy for the Highlanders as he has signed for two years, and he will rehab with his teammates until he gets back to full fitness," he said.